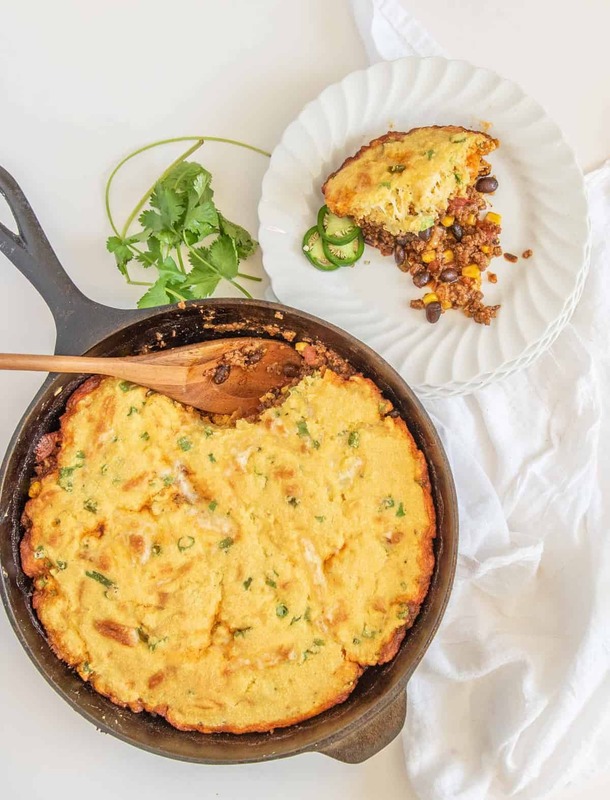 One Pan Tamale Pie is made with a rich meat and vegetable filling topped with a golden cornbread crust that has cheese and green onions in it, all made in one skillet. 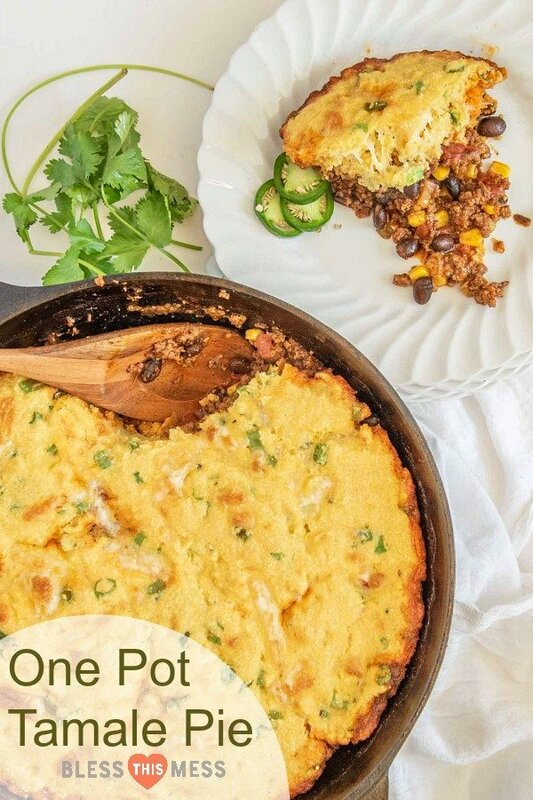 I’ve been eating tamale pie my whole life – it’s one of the things my mom made as a kid. I’ve always liked it, and now I really love it. 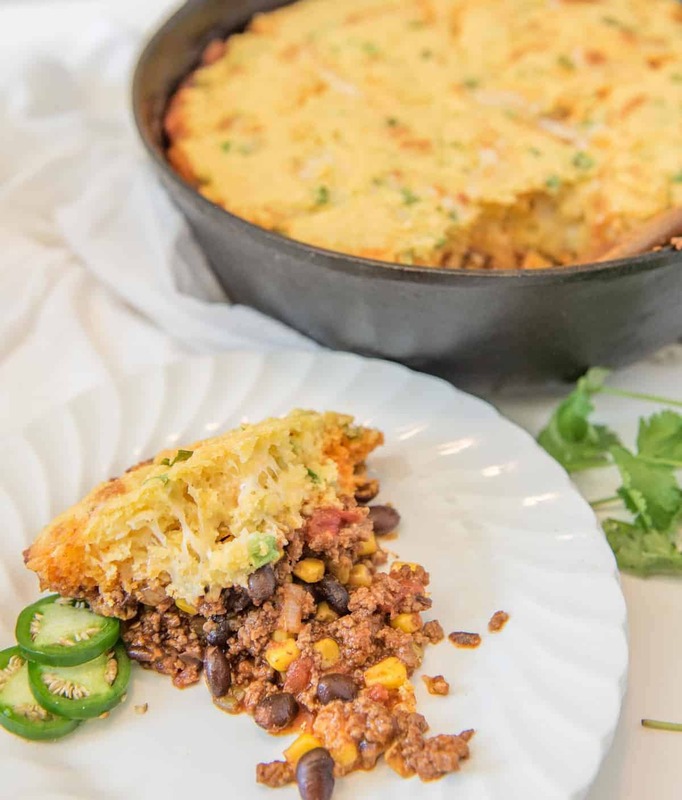 This is the step-up from your average cornbread and chili tamale pie recipes and it’s a keeper. 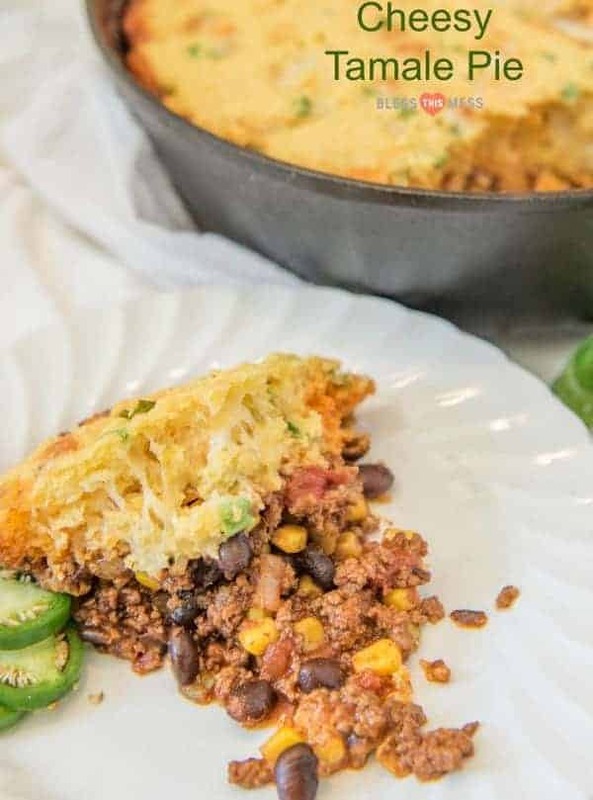 The idea behind tamale pie is that it’s all the wonderful flavors of tamales, all layered together in a pie form. Backed with flavor for a fraction of the time and effort; I’ll take it! This recipe is a favorite at our house because it’s so full of flavor. The filling is made with hamburger, beans, corn, and tomatoes. 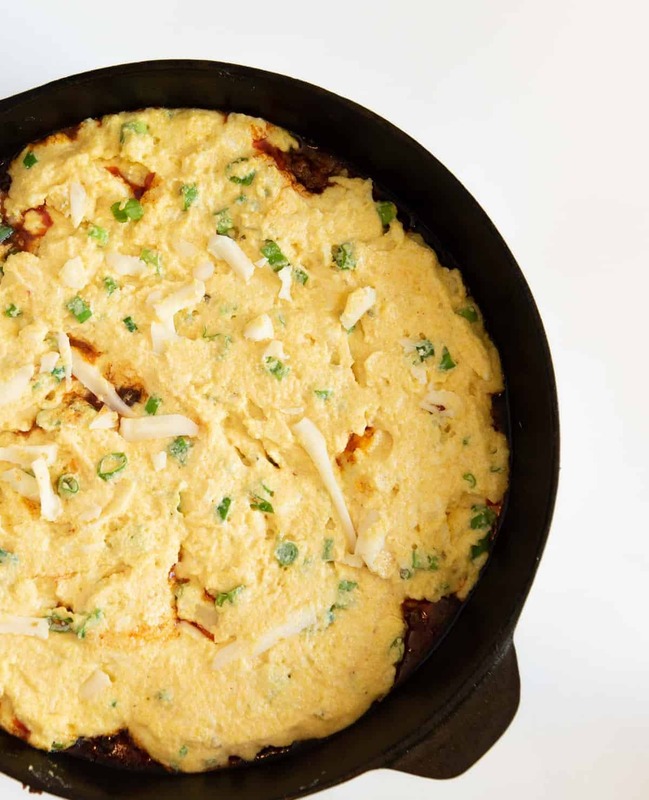 The golden cornbread topping is extra delicious thanks to the additions of green onion tops and some cheese. Seriously, it’s a one-pan dish that you’ll be making over and over again because it’s packed with so much flavor that no one can say no to it. I also like this recipe because it’s pretty easy to make it with what you have on hand. No hamburger? Use just about any other ground meat. Don’t love black beans? Toss in kidney, pinto, or small red beans. And you can top it with all kinds of things like sour cream, salsa, hot sauce, black olives, shredded lettuce, tomatoes, or pickled jalapenos. Make it your own and you’ll love it even more. Want to spice it up a bit? Toss in a chopped jalapeno when you cook up the onions and spices. Want to make sure it’s not spicy? Swap out the pepper jack cheese for a cheddar or colby jack. Both are delicious in this recipe. If you don’t have an oven-safe skillet or dutch oven, you can cook the filling and transfer it to a 9×9-inch baking dish. Mix and spread the cornbread topping on as directed. Feel free to swap out the hamburger for another ground meat that you’d like such as turkey, chicken, or even venison or elk. You can serve this with some sour cream on top. I actually like fresh tomatoes and some thinly sliced lettuce piled on top, plus some hot sauce and black olives. Perk of eating a taco-ish dish – you can top it how you like. In a 10-inch cast iron skillet or dutch oven, add the ground beef and cook over medium-high heat, breaking up the meat with a spoon, until no longer pink, 5 to 7 minutes. Add the whites of the green onion (reserving the green parts for later), the chili powder, oregano, and 1/4 teaspoon of salt. Cook until fragrant, about 1 minute. Stir in the beans, tomatoes (and their juice), corn and broth. Bring to a simmer and cook until the mixture has thickened slightly, about 5 minutes. While the beef mixture simmers, make your cornbread. In a small bowl, combine the flour, cornmeal, baking powder, baking soda, and salt. Whisk to combine. Make a well in the center of the dry ingredients and add the buttermilk, oil, and egg. Use a fork to break the egg and whisk everything together. Stir until the mixture just comes together. Add the remaining green parts of the green onion as well as the pepper jack cheese. Stir to combine. Spread the cornmeal mixture evenly over the filling in the skillet. Transfer the skillet to the hot oven and bake until the topping is golden brown and a toothpick inserted into the center comes out clean, about 20 minutes. Remove the skillet from the oven and let the dish cool for 10 minutes before serving. 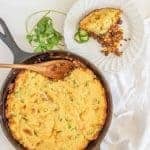 If you don’t have an oven-safe skillet or dutch oven, you can cook the filling and transfer it to a 9×9 inch baking dish. Mix and spread the cornbread topping on as directed. Recipe adapted from and inspired by the Pork Tamale Recipe in America’s Test Kitchen’s One Pan Wonders Cookbook (page 41). It’s a great cookbook – I highly recommend it. I have a whole lot more one pot recipes on Bless This Mess too! Just search for them in the search bar along the top. I’m here to make dinner easy, friends. Can’t wait for you to try this recipe and love it as much as we do. Enjoy from my kitchen to yours. OH YUM! I hadn’t made a tamale pie in forever…..so tonight was the night! I’m a wimp about spice and this was no problem…I may even kick it up a bit next time. The topping was my favorite part….I wanted to keep nibbling at it! He gave it an A…..another keeper….thank a million!!! The crust was our favorite too! I’m so glad you got to make it! Coming my way anytime soon? PS….Cooking and baking this in a cast iron skillet is perfect….one pan from start to finish that rinses off and wipes clean with no effort….my kind of dishes!